Green Machine and Pepperoni Pizza at Vinny's. Photo by Julie Soefer Photography. 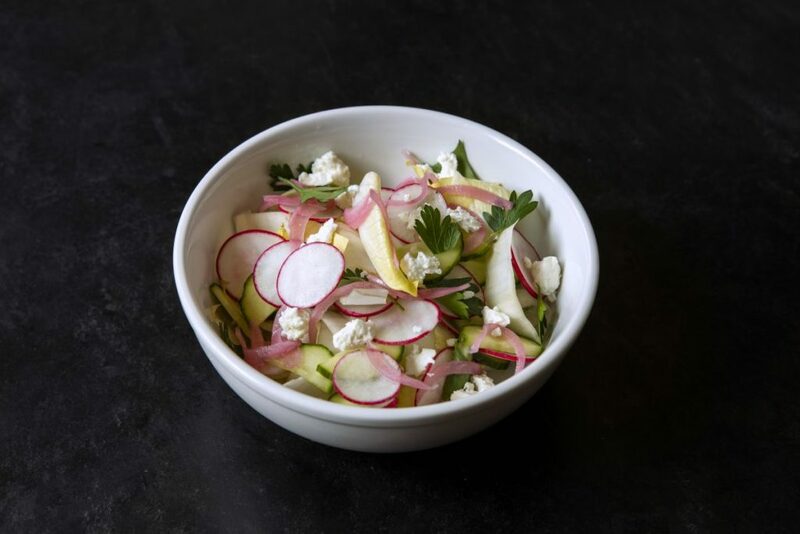 Agricole Hospitality — the brand behind Revival Market, Eight Row Flint and Coltivare — is now opening its new restaurants and bar east of downtown Houston. That process started with Vinny’s, a modern American pizza joint that’s already serving customers. Comfort food restaurant Indianola debuts on November 6 and craft cocktail bar Miss Carousel opens on November 8. All three are located in the same building at 1201 St. Emanuel. Pimm’s Salad at Vinny’s. Photo by Julie Soefer Photography. 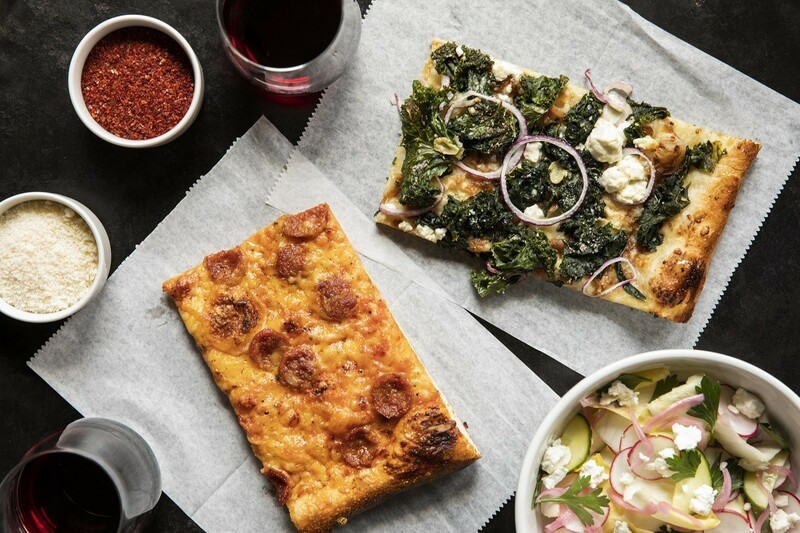 While the company already makes pizza at Colitvare, diners are going to discover that the ones at Vinny’s are a totally different style. For starters, the dough proportions are different, resulting in a different flavor and texture. Most notably, the pizzas at Vinny’s are rectangular and monster-sized: a whole pie is a whopping 52 ounces. Don’t worry about the size, though: Vinny’s also sells it by the slice. The sauce is from canned San Marzanno tomatoes along with Parmesan cheese, fresh herbs, olive oil and garlic. It’s blended cold and not cooked prior to baking the pizza to preserve the tomato flavor. For cheese, Vinny’s uses a combination of Wisconsin Brick (so called because the cheese curds are pressed with clay-fired bricks) and Parmesan cheeses on most of the pies. Others use provolone, smoked cheddar or just the Wisconsin Brick. The flavor is strong and ripe, and the soft texture melts similarly to mozzarella. For meats, the chorizo and Italian sausages are made in-house. Huynh and chef Paul Lewis developed the pepperoni recipe and The Fatback Project in Alabama produces it. Once assembled, the pizzas are cooked in a Woodstone stone hearth oven that burns both wood and gas and has more than 25 square feet of cooking space. 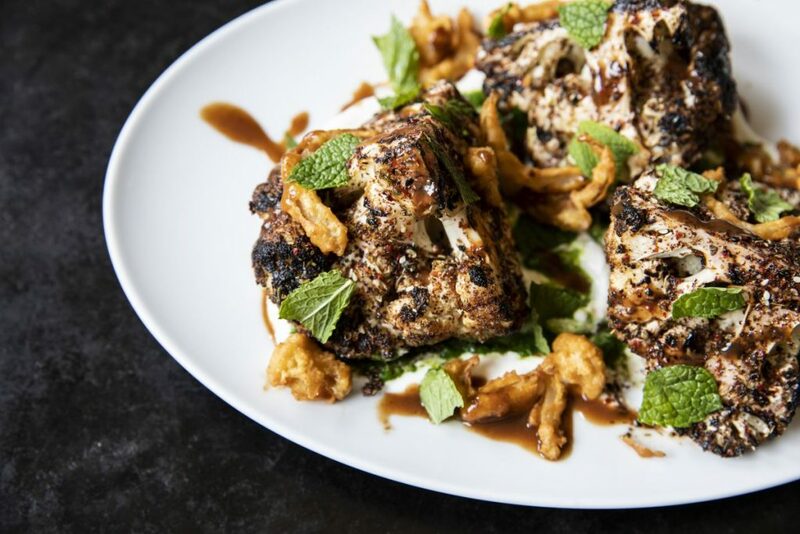 Grilled cauliflower with zaatar, green chutney, tamarind and pakora at Indianola. Photo by Julie Soefer Photography. Over at Indianola, the focus is on American immigrant cuisine. The partners drew on their own heritages as a starting point. Huyhn’s family arrived in San Francisco from Asia, Pera’s were Italians who immigrated to Ellis Island and Weber says his Czech and German forebears came to Texas via the Indianola port from which the restaurant takes its name. “We were talking about the food and the traditions immigrants brought with them,” said Weber. “And as we were conceptualizing the menu, we realized that all of these traditional dishes from other places had taken on a decidedly American spin.” The partners and Lewis — who’s from England — wanted to find a way to represent that on the plate. They were also keenly aware that they wanted to make dishes that would resonate in the EaDo neighborhood. “The American yet worldly approach of Indianola allows us to embrace the different cultures that exist in the United States which gives us a certain amount of freedom as chefs,” said Lewis in a press release announcing the openings. Weber said they’re still finalizing the menu, but guests can expect a broad range. Breakfast dishes include shakshukah, poached eggs with tomato, feta and onion that hails from North Africa with a decidedly Mediterranean flair; Chinese rice porridge (also known as congee) and huevos rancheros. Lunch is a selection of soups, salads and sandwiches, plus larger plates like ricotta gnudi and Ruby Trout with salsa Veracruz. Also expect items like som tum, a spicy Thai salad made with green papaya, wood-grilled Santa Maria steak with tomatillo escabeche for dinner and Basque cheesecake for dessert. Rhum Negroni at Miss Carousel. Photo by Julie Soefer Photography. Miss Carousel is a 5,000-square-foot bar the owners say was designed to be comfortable yet refined. The staff here makes all of the cocktails for Indianola, which means guests at both spots can chose from among 30 cocktails grouped in familial categories such as Collins & Swizzles, Highballs, Sours, Cobblers, Bitter, Spirituous and, Weber’s favorite, Extremely Interesting, Non-Conforming. One of his favorites on the list is the South American Handshake. “It’s a beautiful deal that’s like South American pisco shaking hands with North American bourbon,” he said. The drink is a blend of watermelon falernum, egg white, a dash of cream, orange flower water, lemon and lime, and a bright little snap of mint. When planning Miss Carousel, Weber drew inspiration from classic hotel lobby bars in New York, New Orleans and Kentucky; cozy, clubby places with an emphasis on craft and high-end service. In his research, he realized that each of the places he loved had a signature cocktail and he wanted one for Miss Carousel. Enter the Miss Carousel cocktail, a blend of cognac, rye, Amaro, Nocino (a black walnut liqueur), pistachio and walnut orgeat, orange flower water and lemon. 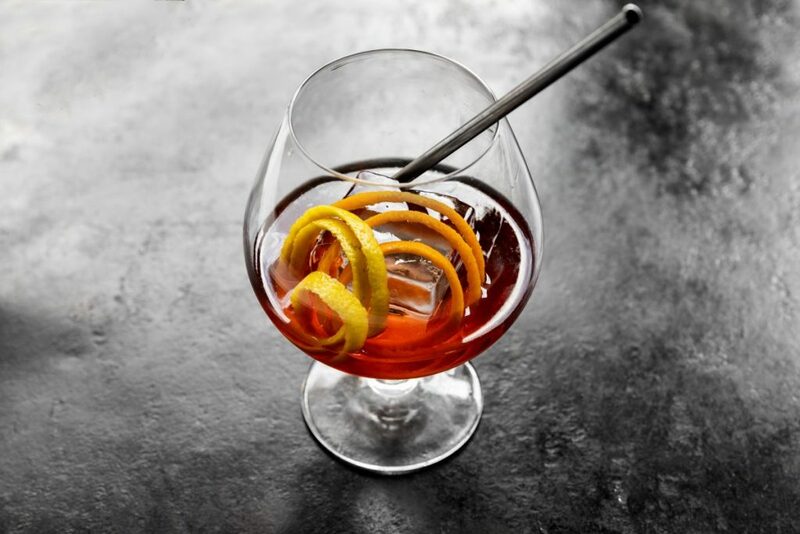 For Weber, the drink blends Old World flavors with a modern, New World approach. Vinny’s operates Sundays through Thursdays from 11 a.m. to midnight and on Fridays and Saturdays from 11 a.m. to 3 a.m.
Indianola will soon open for breakfast Mondays through Fridays from 7 to 11 a.m., and lunch Mondays through Fridays from 11 a.m. to 4 p.m. Upon opening, dinner service will be Sunday through Thursday from 4 p.m. to 10 p.m. and Friday and Saturday from 4 p.m. to 11 p.m.
Miss Carousel runs from 4 p.m. to 2 a.m. every day.